4. Deal with my scraps. I feel bad throwing any useable scraps out. which means I literally go MONTHS without emptying my sewing room wastebasket. (and it's small). I have big plans to make a postage stamp quilt someday (using this totally-cheating-method, as I did with pre-cut squares from a kit here) and I want to use all the scraps I have to do that. But that means I need to CUT MY SCRAPS UP! and keep them sorted so I don't get too overwhelmed. Doable if I deal from here on out, right? here's my list of projects to complete. I don't have to finish them all, but I can't do something else until I finish this list. some of it is cryptic, but I'll provide details/pictures when I get to them. I think I need to post this list on the side of my blog, but I'm not sure how right now. I think I need to post this list on the side of my blog, to keep me on track, but I'm not sure how right now. 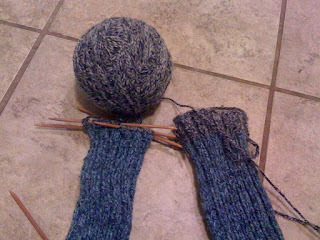 and, in the spirit of actually DOING what I say I'll do, I'm off to FINISH C's socks. 6 months later... I started them in July so they would definitely be done by Xmas. *oops*. but I'm SO CLOSE! I'm on the contrast color, so I only have like 6 rows left! I'll finish these tonight and then maybe finish my bags, which are all cut out, tomorrow. yeah, or just sometime this week. 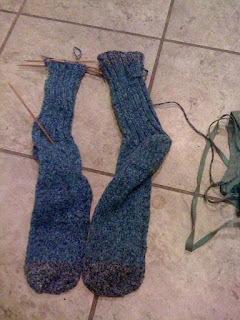 but I can TOTALLY finish these socks tonight if I go RIGHT NOW.